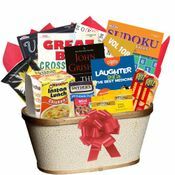 Bestsellers by beloved authors, Oprah's book club, and favorite television personalities make up the current list of great book choices to include inside your gift basket. Choose the book to go with your gift from our list of 20 different titles. Book Baskets are always the perfect gift! These gifts for readers let you choose books from chillers and thrillers to politics and history for your book basket. Gift baskets with books make great gifts for men and women. A book basket gift is a gift that gets opened again and again. 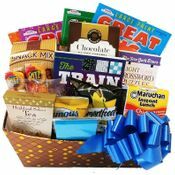 Gift baskets with books come in many price ranges and are created for every kind of reader. You will always find a gift basket for book lovers in your life. So many book choices make it easy to give a gift basket with books. 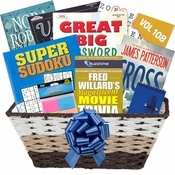 Book baskets are perfect gifts for readers for any occasion. At Book Bouquet we think books make everything better! Give Books, Share Stories, Make Memories it's the theme behind every Book Bouquet. When you give a book basket you are giving a gift with a personal touch that can entertain, comfort, inspire or cause a case of the giggles. That's a gift that is always in style! We've been around since 1998, you can trust us to treat you right, and to send a great gift. We wouldn't have made it this long if we didn't take care of you, our customers! Every gift created has been to solve a gift giving problem. We know we have a gift idea that is just right for your special needs too. From the hard to please to the person that has it all Book Bouquet offers gifts for everyone. We are happy to create custom gifts especially for you! Book Bouquet was started when owner, Kim Shanahan, wanted to send a book to a sick friend in the hospital. Click Here to read more of our story.